Rook & Raven proudly presents David Walker’s first London Solo Exhibition – ‘Brides on Fire’. Working in portraiture, painting freehand, yet using only spray paint and without the aid of brushes, David has developed a signature multi- layered style. Walker’s work brilliantly marries both street and fine art. His use of ‘lowbrow’, contemporary materials and deliberate references to the worst excesses of graffiti juxtapose the classical portrait style to disarming effect. 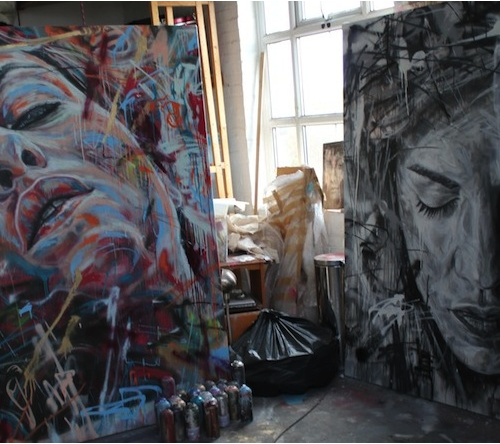 David Walker’s work incorporates dumb marks, countless scrawled lines, clashing colours, drips and decaying letterforms. Ostensibly negatives, these traits are normally associated with the most destructive elements of the graffiti and street art movement. However, the traditional context Walker places them in engenders them with an entirely new meaning. David Walker talks of wanting ‘to make the ugliest of marks within and alongside the beauty of the subject, all out of the same can.’ Hinting at the importance he places upon the potential breadth of his medium. He writes of this creative process “I like to keep things simple which is why I use constraints, my interest is in the process and exploring mark making to see what I can achieve with the medium”. The idea of working from a limited palate is apparent throughout Walker’s work. The unorthodox colours that help populate Walker’s canvases are a nod to the artist’s past, when he had to beg, borrow and steal anything other than black, white and pink. Thus his work sees rebel culture and graffiti art sensibilities laying the foundation for visually rich portraits that fuse photorealism and abstraction to form timeless, beautiful images on street art scale. Above — GIVE A WALL STREET BANKER..